These are some notes that formed the basis of a talk on the Conference on Disarmament to the UN Disarmament Fellows on 21 August 2017. 1. 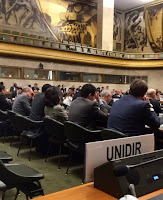 In 1978, the UN General Assembly (UNGA) established the CD as a ‘single multilateral disarmament negotiating forum of the international community’ (see para 120 of the report of the First Special Session on Disarmament (UNSSOD-1)). It is a ‘single’ forum in the sense that it is a standing body with its own secretariat that can conduct negotiations sequentially on agreed topics. In that sense it is a convenient venue for disarmament negotiations, but it is not an exclusive one—it is NOT the ‘sole’ forum. 2. The CD was set up as a ‘negotiating body’. This is in contrast to the UN Disarmament Commission and the First Committee of the UNGA that are ‘deliberative’ forums—venues for developing understandings at most rather than legally-binding treaties. The last negotiations carried out in the CD were from 1994 to 1996 to develop a treaty banning the testing of nuclear weapons (CTBT). Since then, the Conference has briefly begun negotiations on banning fissile material and on negative security assurances (both in 1998) but neither negotiation was sustained beyond that year. Increasingly, States have turned to alternative forums – UNGA (e.g., for the ATT, FMCT and TPNW), Diplomatic Conferences (APMBC and CCM). 3. The CD is a negotiating forum of limited membership (65 States). 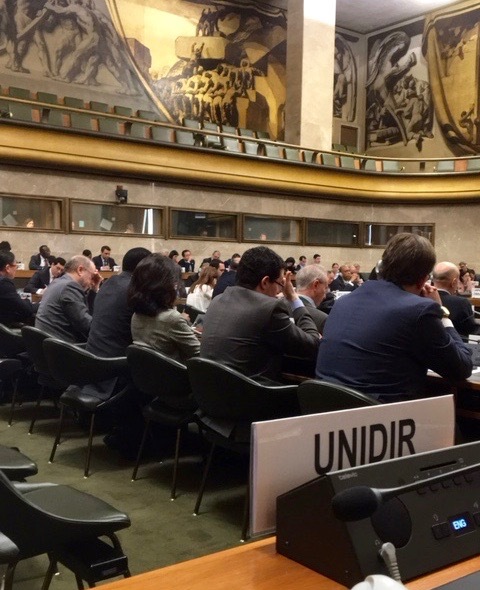 UNSSOD-1 attached ‘great importance’ to the participation of all the nuclear-weapon States. To ensure this, decision-making has to be by consensus (i.e., the absence of a formal objection). This avoids situations, for example, where those States would find themselves in a minority, out-voted on matters affecting nuclear weapons. The consensus rule in the CD is not in itself the reason for the CD’s longstanding deadlock. But because consensus is the sole decision-making rule, there is a responsibility on all members to apply it in a principled way. It should not be treated as a blunt veto but should be used sparingly, ideally only in situations where genuine and exhaustive efforts to seek consensus have been made and where a State’s national interests would be palpably jeopardized. In any event, the difficulty of separating substance from procedure in relation to the weighty security topics on the CD’s agenda means that it is unlikely that members would agree to finessing the consensus rule in any way far less incorporating additional decision-making rules. - assuring non-nuclear-weapon States against the use or threat of use of nuclear weapons (NSAs). The terms of reference of the CD should not to be confused with its annual agenda, or with the Programme of Work (PoW) which is required to be negotiated and adopted at the beginning of each year (Rule 28). 5. The Rules of Procedure of the CD are sometimes blamed for inhibiting the Conference. But the problem is less the rules themselves—after all, they served satisfactorily in the past—and more the manner in which the members choose to apply them. For instance, throughout these past 20 unproductive years the practice of linking mandates for dealing with all four core issues within a single Programme of Work is at odds with the rules. The PoW needs be no more than a schedule of activities - there is no need for it to embody any mandates let alone linking all four where, given the consensus rule, if there's a formal objection to one of the mandates in the PoW they all fail. Mandates, of course, are required for each negotiation the CD launches, but they don't have to be actually incorporated in the PoW. 6. During debates in the CD, States often lament the ‘absence of political will’ amongst members. But the problem is the clashing of political wills, not their absence. Some States want action and progress, but others prefer the status quo. Traditionally, security issues take time to negotiate. Sadly, however, efforts to recognise and overcome the clash of wills have been fitful and feeble. Hesitant attempts have been made to move away from PoWs that link all four core issues, to change the focus of the Conference to new issues, to intensify discussions via an informal Working Group on the way ahead, etc. These attempts have yet to bear fruit. - being always mindful that the advantages of existing as a single (but not sole) multilateral disarmament negotiating forum of the international community will continue to atrophy as negotiations take place elsewhere and the CD’s stature diminishes. In short, the 'rationality and diplomatic solutions' sought of the CD by the UN Secretary-General at the outset of this year's session remain in urgent need of application.